Gio is a crazily addictive rolling ball game that’ll put your balance, dexterity and memory to the test. 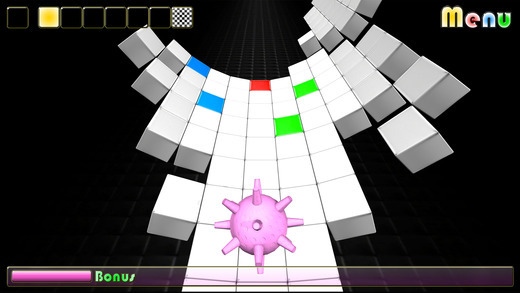 With some quick thinking, simply roll over the colored tiles to build your path ahead. As the ball gains momentum you’ll be twisting and turning to keep it on track with each level presenting new challenges to test your agility. After memorizing a successful route and learning some extreme moves to complete all levels, you’ll never have so much exercise sitting down! Go green! Hope you enjoy. Gio begins with a simple demo upon opening the app. To steer the ball, just face your device towards you and tilt left or right, kind of like a driving game. 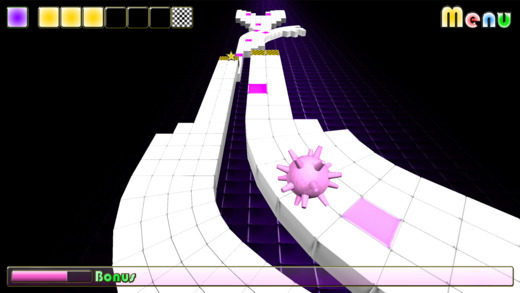 Roll the spiky ball over the colored tiles to build your path in front of you. If you miss a color, you will fall into the abyss and have to start again from square one. Snag a yellow star to set a save point, but to complete the level you still need finish in one go. Roll a red star to change color and continue building your path. Your objective is to get a five-star rating on each of the ten levels. If you are having trouble, hit the Menu button and turn on Level Help to assist you in anticipating the direction of travel. It is very helpful, but beware, as it will reduce your bonus by half. The demo can be skipped if you wish but I highly recommend you go over it for a better understanding of how the app works. It took me a few tries before I truly got a hang of what I was doing. Gio is highly challenging and not as easy as the description implies. There is no speed control of the ball as you play, so no brakes to stop or gas to go, just simple left and right guidance. There is a speed option for the ball that sets it from speeds 1 to the fastest of a 3, which is also the default. Slowing the spiky thing down helps tremendously, but will also effect your overall score. The visuals are intriguing as is the music, which does come with options to turn it off. The controls could be a little more responsive, but I think that is something I always seem to desire when it comes to apps with this steering wheel type set-up. The name of the game is repeat, repeat, repeat. Eventually, you will get it. The madness of not completing will simultaneously make you want to quit and give it a try just one more time. The app is available now in the App Store for only $1.99.